LAS VEGAS -- A supply base still in recovery mode is hampering Audi's potential to sell more vehicles around the world, and the problem may persist through most of 2011, Audi AG CEO Rupert Stadler said. 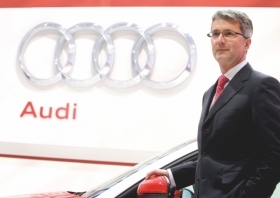 Stadler said Audi has a 14-day vehicle supply in the United States, instead of the usual 30-day supply. For some models, such as the Q7 premium SUV, the number is even smaller. He blamed the short supply on bottlenecks within supplier production. “Lots of suppliers still have to ramp up their capacities,” he said. That situation won't ease for another six to nine months, he predicted. Separately, Stadler said Audi plans ambitious growth in the United States within the next five years, thanks to a new product portfolio and a number of hybrid derivatives. Audi plans to sell nearly 160,000 units in the United States by 2015, up from a record 101,629 last year. Audi will get aggressive with its hybrid strategy within the next 18 months, Stadler said, starting with the launch of the Q5 and A6 hybrids in Europe this year, followed by an A8 hybrid next year. He said all of these models also will be launched in China and the United States within two years.